I have been debating about calling this page the “Awards” page or “Accomplishment” page. I thought I would group them all on one page. It isn’t a long one but I felt a need to let others know a little more about some of the goals that I have set and finally met. My Awards should actually be “Award”. My accomplishments have to do with cutting. I have always been a believer that the blade should be the ultimate cutting tool first, comfortable second, and look good last. It is possible to have all these qualities in one blade and the size will depend on its cutting duties and the requirements of the owner. First Place 8″ Tactical knife cutting comp. Batson’s Symposium, Tannehill, AL. April, 2006. In May of 2015, I inquired about a knife making contest for the history channel. It was called “Forged In Fire” and I was accepted for the competition for the last episode. There were only 8 in this first season and feel very fortunate that I was able to be in it. It was a delightful experience and I truly enjoyed competing against my friends. From my point of view, we were all winners just for being there and leading the way to a truly great TV program. I did go home in the second round. 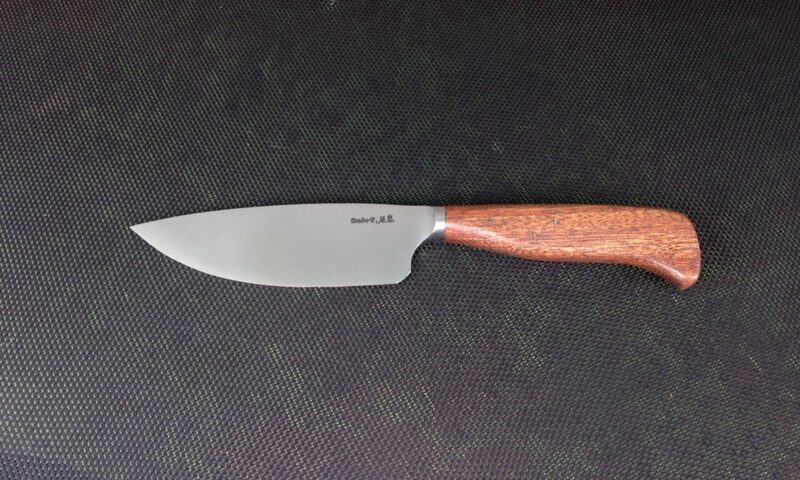 My good friend, Mace Vitale of Connecticut ended up the winner with his mora kris. From what I have read, there was 1.4 million viewers for the weekly show. That is a lot of people that were able to enjoy seeing what I enjoy doing. Looking forward to seeing the new season as it has been renewed. I was able to go back on the show, Forged in Fire, for a fan favorite show. Chad Osborne, Robby Bowman, and Josh Weston, along with myself met to compete against each other. Josh and I got to come back to our home forge to make a Panabas, a large blade used in the Philippines for clean up after a battle. We tied on performance and Josh had the prettier blade so he won, and I got my knife back. They kept his. The FIF experience has been nothing but wonderful for me. I have met a lot of great knife makers and we meet in Pigeon Forge in September now for a Grudge Match. This is our fans to see us hammer out something in person and have a chance of going home with it. We give all the forged items away by drawing a ticket that the audience gets when they come to see us, no cost. We do have just a little bit of bragging rights that lasts till the next match. A great time to get together and even sell a few of our knives to those that attend. This year it will be the 21-23 of September at the Iron Mountain Metal Craft forge of Robby Bowman in Pigeon Forge, TN. There is no charge to watch.